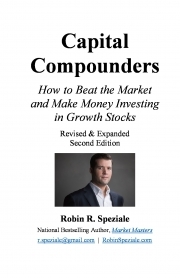 Description of "Capital Compounders (eBook)"
In Capital Compounders, DIY Investor & National Bestselling Author Robin R. Speziale makes it easy for anyone to beat the market and make money investing in growth stocks! Robin R. Speziale shares his journey building a $300,000+ stock portfolio before 30 (and how you can too!) by investing in growth stocks or “Capital Compounders” – stocks that double, and then double again, and again on the market. Capital Compounder stocks have achieved the “tenbagger” ($1 turns into $10), and some even the “100-bagger” ($1 turns into $100) status. Mr. Speziale discusses the commonalities of today’s market-beating growth stocks so that you can find the next ones in the future. Capital Compounders is for both budding and seasoned investors. It’s entertaining (because finance can be dry), and includes lots of easy-to-learn tips and strategies on growth investing that you can apply in the stock market. Robin R. Speziale is a DIY Investor and Globe and Mail National Bestselling Author; Market Masters (2016). He's been investing in the stock market since 2005, and built a $300,000+ portfolio before 30. Mr. Speziale lives in Toronto, Ontario. Visit RobinRSpeziale.com and email Robin – r.speziale@gmail.com. Robin Speziale is the National Bestselling Author of Market Masters (2016), which features exclusive conversations with Canada's top investors, as well as Capital Compounders (2017/2018), and Lessons From the Successful Investor (2010). He won the Independent Publisher Book Award for Finance/Investment/Economics in 2017. As a DIY Investor, Robin has been saving, investing, and building his portfolio since 18. Before 30, he built a $300,000+ stock portfolio. Robin lives in Toronto, Ontario. "Mr. Speziale has plenty of advice to pass on in his new book." Reviews of "Capital Compounders (eBook)"